Gandhi Jayanti is observed on 2nd October every year. It is the birthday celebration of Mahatma Gandhi, Father of the Nation. It is one of the national holidays in India. Celebrate this important day by sending Gandhi Jayanti messages to your family, friends, colleagues, boss and everyone else. Share the inspirational Gandhi slogans for freedom to remind them of the sacrifices made. Enjoy the huge collection of Happy Gandhi Jayanti wishes. 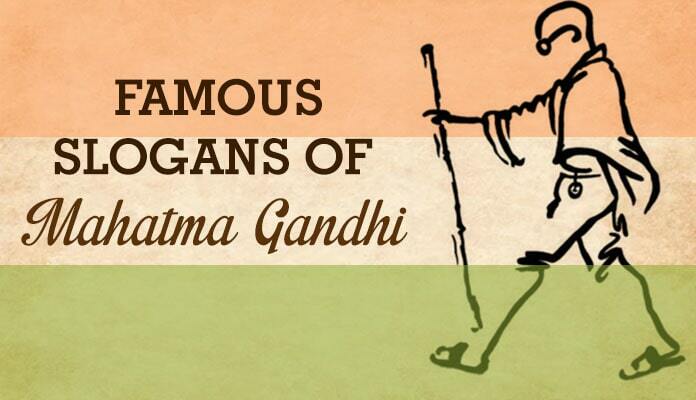 Send these famous slogans of Mahatma Gandhi to your near and dear ones. Use these Gandhi Jayanti slogans in Hindi and English to send best of wishes on Facebook, WhatsApp. Kaano ka durupiyog mann ko dushit aur ashaant karta hai. The weak can never forgive, forgiveness is an attribute of the strong. 2nd October Gandhi Jayanti Funny Messages – Check out beautiful collection of Happy Gandhi Jayanti Funny Jokes in Hindi and English. Jab aapka samna kisi virodhi se ho toh aap use premse jeetein, ahimsa se jeetein. Kisi ki meherbani maangna, apni aazadi bechne jaisa hai.